Formed in 1997, Twiztid is an 11-time Billboard chart-topping rap duo featuring Jamie Madrox and Monoxide Child (a.k.a. Jamie Spaniolo and Paul Methric). The two former members of the group House of Krazees departed that group and formed Twiztid in 1997. Now, 20 years later, the Twiztid guys are still going strong with more than 20 albums in their catalogue. Madrox and Monoxide Child could be content to settle into the cycle of releasing an album, touring extensively in support of the disc and then starting the cycle all over again with a new album. But, that’s never going to happen. That’s the “straight” way and Spaniolo and Methric do things the “Twiztid” way. Twiztid will visit the area on February 11 for a convert at Reverb (1402 North Ninth Street, Reading, 610-743-3069, www.reverbconcerts.com). The show is part of the duo’s “Eat Your Heart Out” U.S. tour. Back in October, Twiztid played a gig at the Troc in Philly as part of its “Spooktacular Horror Show” tour. On February 14, the pair will present Twiztid’s “Fourth Annual ‘Be My Bloody Valentine’ Show in Virginia Beach and then will embark on its “Freektasteless Show” tour. “‘The Continuous Evilution Of Life’s ?’s’ came out just over a week ago and charted at Number 28 on the Billboard Top 200 charts,” said Madrox, during a phone interview Tuesday. “We’ve been working our asses off – staying the course and keeping true to the cause. Right now, we’re in the middle of our ‘Eat Your Heart Out’ tour. 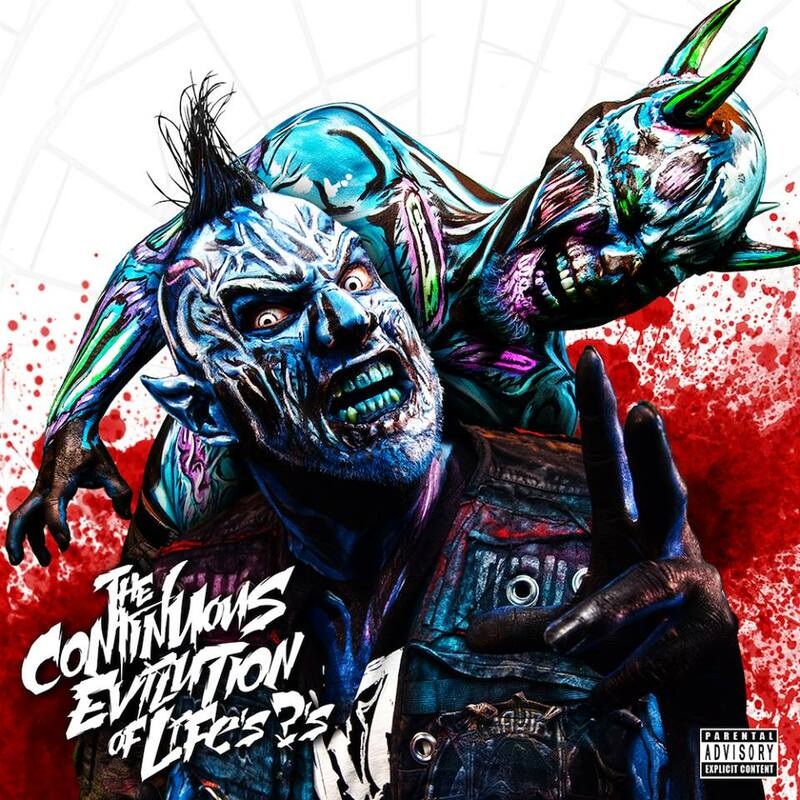 “The Continuous Evilution Of Life’s ?’s” might just be Twiztid’s best album ever. “The new album dropped on January 27,” said Madrox. “What I like about the new one – we didn’t have any boundaries. We did songs we like to do. “It wasn’t about doing what was expected of anyone. We catered to ourselves and we had a great time in the studio. I feel this time around there is a nice blend of everything. There is something for everyone – even if they didn’t know they wanted it. 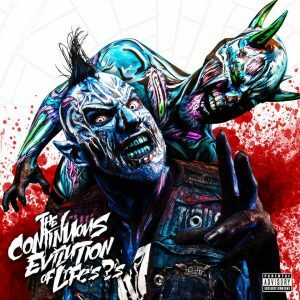 “The Continuous Evilution Of Life’s?’s” features 12 all new tracks, primarily produced by longtime Twiztid producer Seven. However, the new album features four tracks with a clear hard rock influence — a crossover genre the duo has successfully dabbled in for over a decade. These tracks were produced by famed goth rock front man Davey Suicide and his keyboardist Needlz. “There was a catalyst for us doing a few hard rock songs,” said Madrox. “Right around the time we made our ‘Freekshow’ album in 2000, was when rap rock started taking off. The two long-time friends from the Motor City have also devoted a lot of time and energy to building Majik Ninja Entertainment. “It’s been a really busy time – not only with the band thing but we’re also doing the record company thing,” said Madrox. Video link for Twiztid – https://youtu.be/4QtokETDSiQ. The show at Reverb, which also features Blaze- Ya Dead Homie, Iamtheroc, G-Mo Skee, Lex The Hexmaster, Boondox The Scarecrow, The R.O.C, DRANGD, Kourt Jester and Lungz the Soulstealer, will start at 6 p.m. Tickets are $18 in advance and $20 at the door. 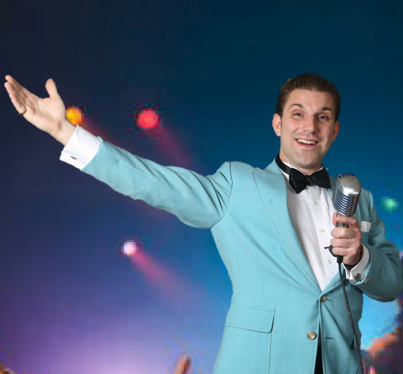 Fans of romantic music are invited to come out to Harrah’s Philadelphia for a night with the music of Frank Sinatra, Michael Buble’, Dean Martin and the other great crooners. Hosted by Rotation Records, Peter Cannella and the Choper Jazz Project will treat the audience to an evening of romantic standards. Cannella, who has a distinctive voice, continually impresses audiences when he covers these great songs. Cannella describes his sound as traditional pop, swing and jazz. Also an accomplished songwriter and arranger, the singer and his band – The Choper Jazz Project — throw in an occasional original featuring a combination of traditional pop and dominant elements of modern music. Harrah’s is issuing an invitation to music fans to come with friends or their special love and enjoy a night like it was back in 1960’s Las Vegas. Video link for Peter Cannella — https://youtu.be/-I4AFfWU-wk. Doors at The Block open at 8 p.m. Tickets are $15 for general admission. Another local show on February 11 will fall in the middle of these two extremes when Annabelle’s Curse plays Ortlieb’s (847 North Third Street, Philadelphia, 267- 324-3348, www.ticketfly.com). Annabelle’s Curse is an alt-folk band from Bristol, TN/VA. 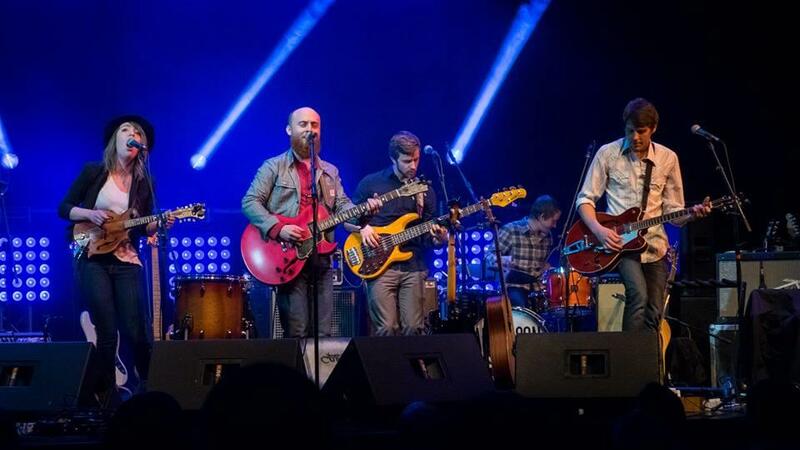 Its members are Tim Kilbourne (vocals, banjo, guitar), Carly Booher (vocals, mandolin), Zack Edwards (guitar), Travis Goyette (percussion), and Tyler Luttrell (bass). As an independent band, Annabelle’s Curse’s fan support has been instrumental to the group’s success. The quintet has released three full-length albums. The band’s two most-recent albums – “Hollow Creature” and “Worn Out Skin” — were fully funded by fans. Since forming in 2010, Annabelle’s Curse has toured extensively, developing a devoted fan base throughout the Southeast and Mid-Atlantic. “It started out as a three-piece with Zack, another guy and Tim,” said Booher, during a phone interview Tuesday from Virginia. “Tim and Zack are the only two original members left. Travis and I were local and we all got to know each other as friends. 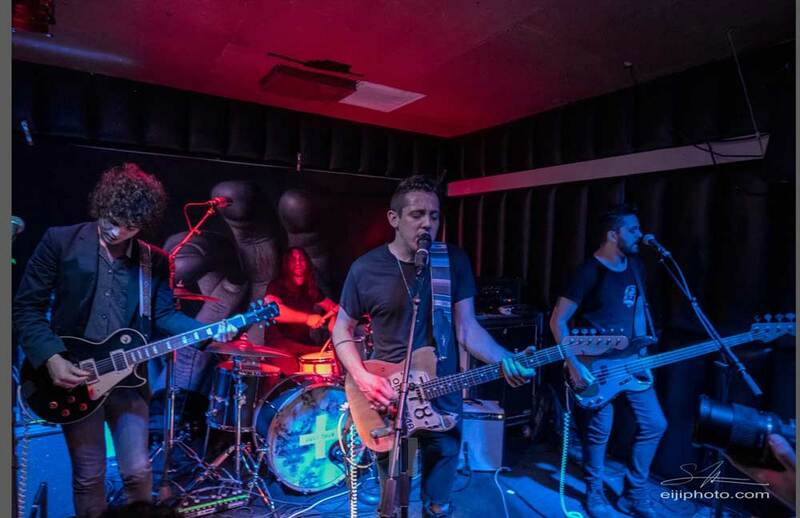 Annabelle’s Curse is an Americana band with some added elements. According to Edwards, “We have kind of strayed from our roots a little more with each new album, leaning a little more on the electric side of things. That’s also allowed for us to get weirder with our effects and textures. 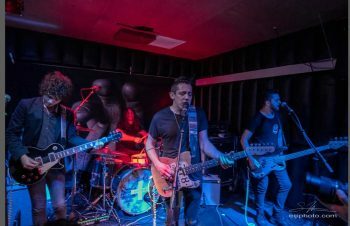 The group’s new EP, “Here and Now” (due for release February 17, 2017), was produced by Bill Moriarty and Zach Goldstein. “We recorded the EP at the same time we were recording our last album,” said Booher. “We cut the album last July at Kawari in Philadelphia (Kawari Sound Recording Studio in Wyncote). Writing is a band effort – and a never-ending endeavor. “Our writing process is never stop and start writing for an album,” said Booher. “It’s a continual thing – a process that doesn’t really start and stop. Video link for Annabelle’s Curse – https://youtu.be/1amkV1VnCc0. The show at Ortleib’s, which also features Sing, Bird of Prey, and Nicklas Hughes, will start at 8 p.m. Tickets are $8 in advance and $10 at the door. 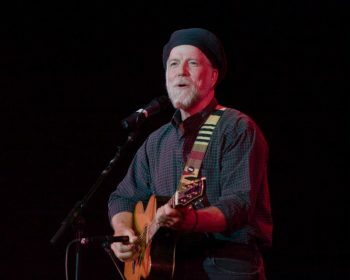 John McCutcheon will make a rare area appearance with a concert on February 12 at The Sellersville Theater (24 West Temple Avenue, Sellersville, 215-257-5808, www.st94.com). 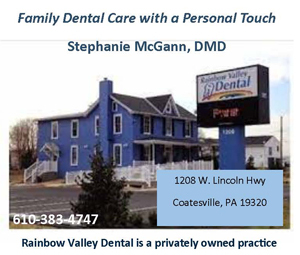 McCutcheon is a Renaissance Man – one who prefers the rustic vibe of rural America to the pomp of a royal court. He is one of America’s most respected and loved folksingers. As an instrumentalist, he is a master of a dozen different traditional instruments. His career has already spanned more than four decades. McCutcheon has received every imaginable honor, including six Grammy nominations. He has produced more than 20 albums for other artists. He also has written numerous books and instructional guides and helped start the first traveling musician’s union — the Local 1000. McCutcheon plays numerous instruments including piano, guitar, auto harp and banjo. He is one of the world’s master players of the beautiful hammered dulcimer. Usually, he plays all or most of these instruments during his one man show. On February 3, McCutcheon released his latest album “Trolling for Dreams.” It is his 38th album – the same amount released by Bob Dylan. “The songs for ‘Trolling for Dreams’ came in two parts,” said McCutcheon, during a phone interview Tuesday from his home in the Atlanta suburb of Smokerise, Georgia. “Some of the songs were written six or seven years ago. I have this file where I keep different parts of songs – notes that I’ve written on napkins or airplane barf bags. The file has all these scraps. “I got sick last January and was confined to home for two months. I went through the entire file. Some songs were fully done. Some just needed fine-tuning. “When I went in to Bias Studios in Springfield, Virginia to make the album with engineer Bob Dawson, I had 35 songs ready. And then, some things were written on the way to the studio. “I wanted to work with Bob because he can make voice sound better than any other engineer in the world. I put my band back together and flew them in. It’s a core band with guitar, keyboards, bass and drums. “I worked pretty quickly in the studio. I was acting as producer as well. We recorded most of it live. The bottom line was – did it feel right? We ended up using a lot of first takes. As a producer, I don’t come in with charts and say – play I this way. I hire musicians for their musicality. Like many of the folksingers from the past, McCutcheon does not shy away from writing political songs. Video link for John McCutcheon – https://www.youtube.com/watch?feature=player_embedded&v=PtnHMKW0oZk. The show on February 12 will start at 7:30 p.m. Tickets are $25 and $39.50. For the longest time, the name “Mona” meant one thing in the world of music – a song that was recorded by Bo Diddley in 1957, the Rolling Stones in 1964 and Quicksilver Messenger Service in 1969. The song, which was written by Ellas McDaniel, was also recorded by the Troggs, the Nashville Teens, and the Grateful Dead. That changed 10 years ago with the emergence of Mona, an alt-rock band from the Midwest. Mona — Nick Brown (lead vocals, guitar), Vince Gard (drums, percussion), Zach Lindsey (bass, backing vocals) and Jordan Young (guitar, backing vocals) – has its roots in Dayton, Ohio and Bowling Green, Kentucky and now calls Nashville home. On February 15, Mona’s current tour will touch down at Boot and Saddle (1131 South Broad Street, Philadelphia, 215-639-4528, www.bootandsaddlephilly.com). The band is touring in support of its new EP “In The Middle,” which was released in October 28 on Bright Antenna Records. “We recorded a group of songs over the last two-and-a-half years,” said Brown, during a phone interview from a tour stop in St. Louis, Missouri. “The six songs on the EP were all done at different times. We originally were looking to do an album but then decided to go with an EP. “We hadn’t released anything in a while so we wanted to re-introduce ourselves. It’s a lot easier to do this with a smaller batch of songs. We’re constantly compiling ideas. “I own our studio so we are able to record at our own pace. There was no pressure. We never set time aside to write and we never run out of material. Now that the EP has seen the light of day, Mona is looking ahead to its next full-length. “We have 10 songs that we already know could be the album,” said Brown. “You never know. Songs are constantly beating each other out. We’ll be writing and recording right up to the time we release the album. Video link for Mona — https://youtu.be/rgK_zzfYoUU. The show at Boot and Saddle, which also features July Talk and Little Junior, will start at 7:30 p.m. Tickets are $12 in advance and $14 at the door.